Not all tales of ghosts and ghouls are necessarily spooky. Some are even a little amusing while others are a little sad. Pitiful even. But we're not interested in weedy do-goody ghostie tales for all the family... are we? Let the spine chilling terror begin...! Back during the civil war, you can bet that a lot of soldiers lost their lives fighting in battles that defined a country at a cost that many debate was not worth the sacrifice. However, that's a topic for a different discussion in a different place. The angle I'm working here is that (taking for granted you believe in ghosts) there will have been a heck of a lot of restless souls that were maybe too confused to go all the way into that spectral light that is supposed to beckon us as we leave this mortal plane. That would have left them wandering in the earthly spirit world, searching for who knows what and not knowing where to find it. 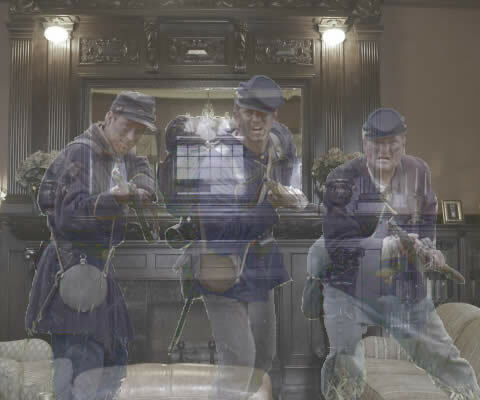 There have been many anecdotal instances of sightings of the ghosts of both Confederate and Yankee soldiers roaming the grounds and corridors of old stately houses. Who knows whether they are true or not? Hence, part of the purpose behind the resurrection of this site is to take a look at the subject of where we go and what we become after we pass on. Plus I want it to be an entertaining read for anyone looking for the lighter side of the world of spirits, ghosts, ghouls, specters, sprites, phantoms or whatever you like to call them. It's like a continuation of the journey of life that crosses the border into what comes next. Is it really so serious? Or do those unfulfilled souls that don't "cross over" have a sense of humor and maybe even a mischievous side to them that most folks don't consider? I like to think that the sense of humor we have in life continues on after. So I'm taking the lighter side of this particular road and not being too serious about any of it. Dressed as a Zombie Hunter for Halloween? Kids will be kids and when it comes to trick or treat, getting the costume right is really important if you not only want to look your best for knocking on all your neighbor's doors, but also for the "cred" you get from your friends for wearing a totally cool costume! Well, this year the cool costume to be seen in just so happens to be the zombie hunter costume that is mainly for boys but there is no earthy reason why girls can't wear them too. So what is this all about, anyway? Well, it seems the movie industry might just have played a small part in glamorizing the role of the zombie hunter as he tracks down and destroys the murderous and uncontrollable zombie undead hoards and saves the day for all humanity. Yeah, we all want to be the hero, right? Well, not all of us as there are plenty of willing zombies this year snapping up all manner of zombie costumes too. Its just that the hero types will opt for a zombie hunter outfit to go around outsmarting all the zombies! Well, that's sort of how it works, anyways. So what about the girls? Do they play the subdued, fair maidens that need to be rescued from the terrorizing zombie monsters by their chivalrous hero hunter? Depends on what they want... if it's to get the boy of their dreams, then of course they will! But if they are not bothered about all the boy girl stuff just yet, then they are sure not going to let the boys get all the credit for being the heroes! Well, good luck to all this year and may they have a really great trick or treat. Its for kids after all... that is until they are all safely tucked up in bed and the adults get their chance to dress up in even cooler and infinitely more sophisticated costumes that are sure to turn heads and get the gossip machine going at this year's Halloween part that is sure to be a real winner! Have a great time!